Sebastian Michaels in his 21 Days to Creative Abundance program paraphrases a quote from Tony Robbins, saying: The only thing preventing you from getting where you want to be is the STORY you are telling yourself. I’m not a real artist; I didn’t go to art school. I’m not a real artist; I’m just a weekend dabbler. I’m not a real artist; I can’t draw. I’m not a real artist; I got rejected by a gallery. I’m not a real artist; I’ve never sold anything. I’m not a real artist; my work doesn’t have a profound message. I’m not a real artist; I just mess around with photos. I bet we could go on. My particular story was that I wasn’t born creative or artistic. For years I knew that was true because no one ever made over my childhood artwork or called me creative. So, for thirty years after I left home, I let that story dictate my life. As a matter of fact, it wasn’t until I turned 50 that I began to entertain the thought that I might be creative. And, this is the ridiculous part, I was teaching creativity by then and telling my classes that *everyone* is creative (which I truly believe) while the little voice in my head whispered … “except you. You are the exception to the rule." I tried a multitude of media … drawing, watercolor, pastels (oh what a mess I made there! ), acrylics, colored pencils and markers. Bupkis. I did manage to do a few collages that I liked but my skills sucked and there were always wrinkles, air bubbles and loose edges in each piece. Then, I discovered digital collage and my story began to crack. I could do this. So, I started cycling through the other stories one by one. I think I’m done now. I am making art. I am an artist. It’s not my call whether it’s good or bad. It just is. Just as I just am. When we think about it, these stories sound pretty silly. If someone plays golf on a sunny weekend, we call her a golfer, even if she doesn’t break 100 … even if, heaven forbid, she doesn’t keep score. People who cook are cooks, people who sing are singers, people who make art are artists. I’m an artist. I make art that sometimes thrills me and sometimes frustrates me. However, I am deeply grateful that I get to participate in this process of putting bits and pieces of the real world together to create what calls to me from my imagination. I am a digital artist. Challenge #17 was to rework a previous piece, print it, and give it to someone. I picked a piece that I thought was finished, and, it was, mostly. However, while working on it, it developed a new identity. Digital artistry operates on the same principles as other art, so the Muses who watch over this process each have their own area they protect and inspire. 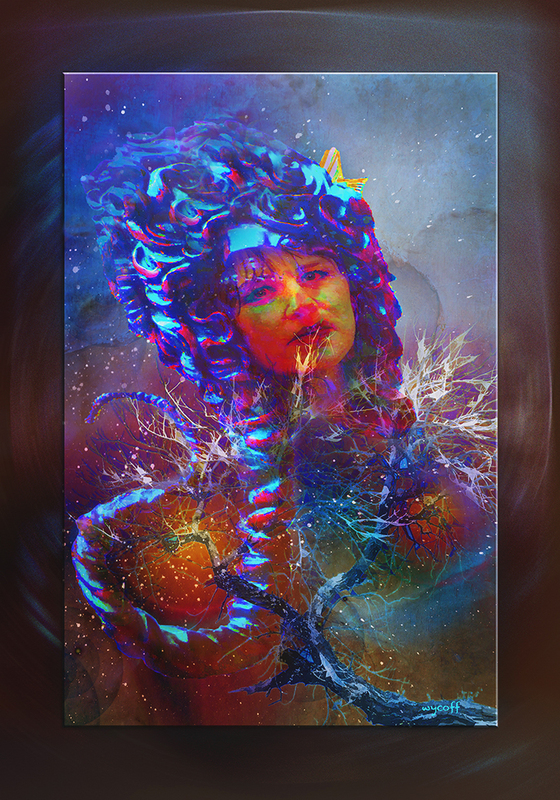 And, just like the sister-goddesses of Greek Myth, there are nine digital artistry muses. The first we’re meeting is the digital artistry muse of story. Her name is Esperanza (Hope) because sometimes all the elements of an image come together to create a story, and, in that moment, hope is born into the world. This post was prompted by Sebastian Michael's "21 Days to Creative Living" and "Photoshop Artistry" programs. More information here. I love and embrace your rewritten "story." Create with passion, dear friend! YES to "It’s not my call whether it’s good or bad. It just is. Just as I just am". And love the idea of yr 9 muses. May Esperanza lift you up whenever you need a lift. Maybe the muses will watch over our salon.